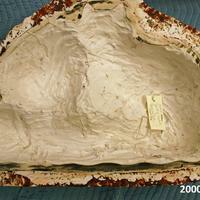 Mold for Spirit of Kentucky. Plaster mother mold with inner rubber mold and plaster core. Has "Spirit of Kentucky Raccoon and Fish" written on mold.